These Strawberry Rhubarb Barbecued Chicken Wings recipe combines sweet, savory, and spicy flavors. This recipe can be part of a low-carb, gluten-free, grain-free, ketogenic, diabetic or banting diet. I admit that this is one of my more unique recipes, but sometimes I just need to have a bit of fun in the kitchen. I’m all about exploring foods and trying different combinations. Sometimes, as in this case, they work! This recipe has been on my mind for a while. I love barbecue sauces that contain fruit flavors like peaches and cherries. 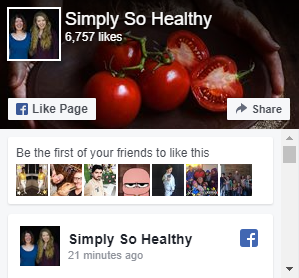 I started contemplating how I could make a similar sauce that is low carb. A combination of strawberries and rhubarb came to mind. I grew up on strawberry-rhubarb sauce. We had a patch of rhubarb in our backyard that was the crowning jewel of our neighborhood. The patch was huge, with jade leaves and ruby stalks up to my knees. This patch produced enough rhubarb for not only our family, but to give as gifts to neighbors and relatives. When rhubarb was in season, my mother carefully thinned the plants, removing stalks , but not too many, from each plant. 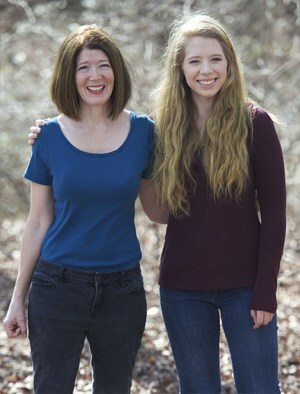 She made rhubarb pies, strawberry-rhubarb cobblers, and vats of strawberry rhubarb sauce. The pies and cobblers were eaten fresh, but the sauce was spooned into freezer containers, put in the big chest freezer, and used throughout the year. My mother served her strawberry-rhubarb sauce as a side dish, with ice-cream, and sometimes even as a condiment with meat. Somehow the flavors worked for all of these uses, so, of course, I thought about strawberries and rhubarb when I was contemplating creating a fruity barbecue sauce. 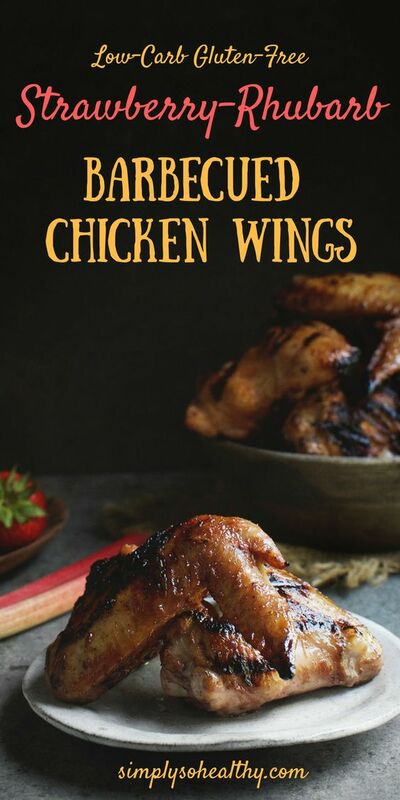 My recipe for Strawberry Rhubarb Barbecued Chicken Wings has a sauce that is much more complex than the sweet and fruity sauce my mother made. My recipe starts with similarly to her sauce, then I add some tartness with some vinegar and rich flavors of onion, garlic, and cumin. Finally I heat the whole thing up with some cayenne pepper and some red chili pepper flakes. Now we’re talking barbecue sauce! This sauce is great on wings, but could be used with other chicken cuts as well. I love it on chicken tenders. It would also pair well with pork. 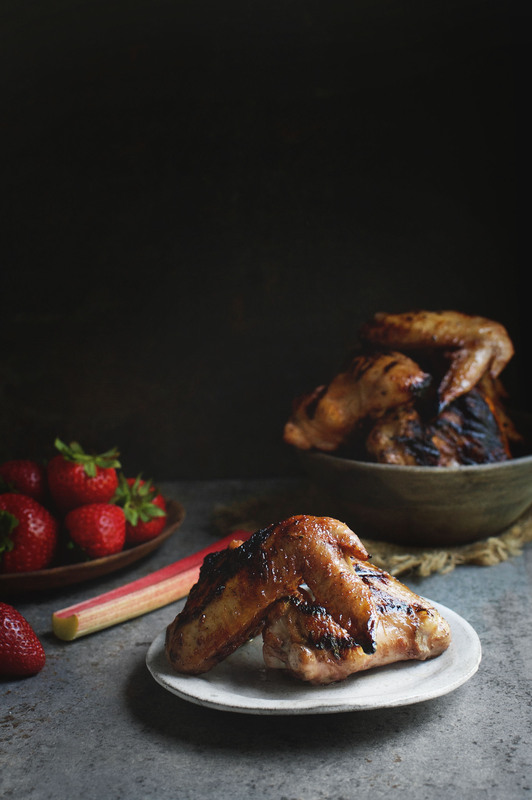 Serve these Strawberry Rhubarb Barbecued Chicken Wings as an appetizer, snack, or main course. Enjoy! This Strawberry Rhubarb Barbecued Chicken Wings recipe combines sweet, savory, and spicy flavors. 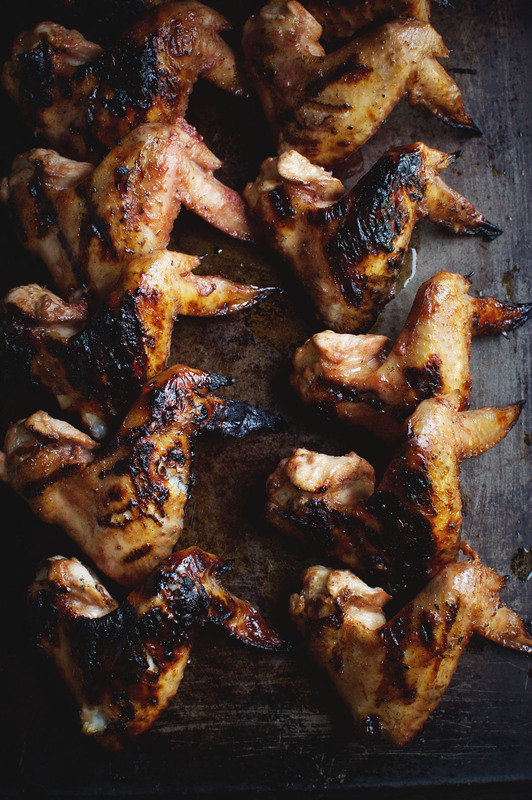 These wings can be part of a low-carb, gluten-free, grain-free, ketogenic, diabetic or banting diet. 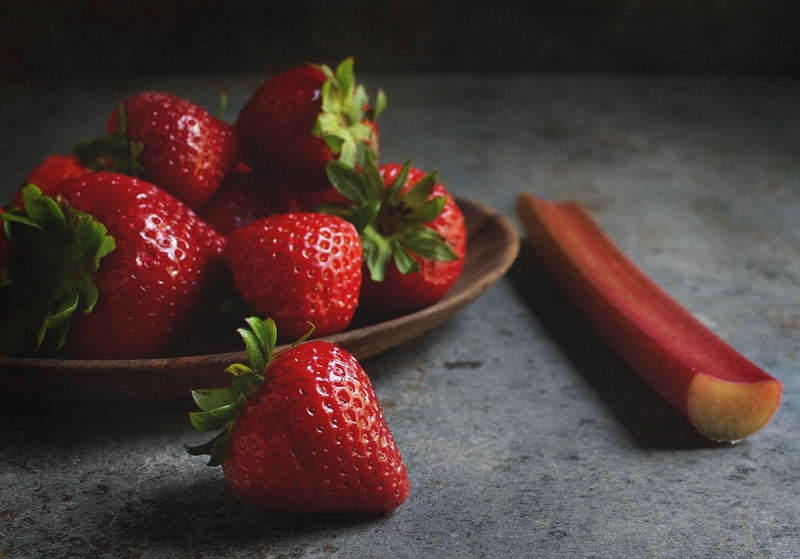 Add rhubarb, strawberries, and sweetener to a medium saucepan. Bring to a simmer over medium-low heat. Once simmering, reduce heat to low. Simmer, stirring frequently, until mixture develops a consistency similar to ketchup, about 15-20 minutes. Stir in vinegar, Worcestershire sauce, cayenne pepper, onion powder, garlic powder, cumin seeds, red pepper flakes, black pepper and salt. Bring mixture back to a simmer and simmer over low heat, stirring frequently, to thicken, about 5-10 minutes. When the mixture has the consistency of a tomato sauce, remove from heat.. Allow mixture to cool for 15-20 minutes before proceeding. Mixture may be made in advance and refrigerated in an airtight container overnight. Place chicken wings in a 9" X 13" glass container. Pour sauce over and stir to coat each piece thoroughly with sauce. Cover container and refrigerate for 3-5 hours. 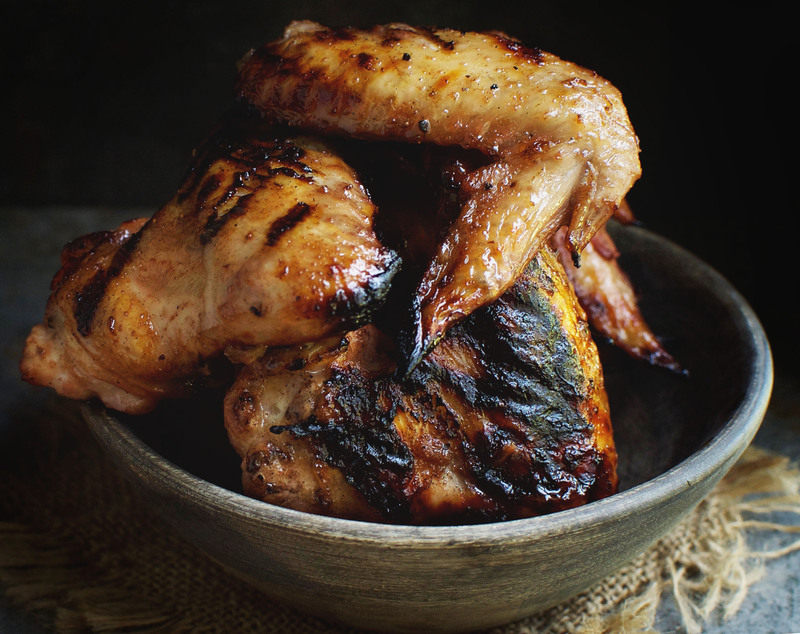 Remove wings from refrigerator about a half hour before grilling to allow them to warm to room temperature. Preheat grill to high heat. Place wings on grill and cook over high heat with lid open for about 2-3 minutes, or until the first side is seared. Turn and sear the other side for 2-3 minutes. Close grill and turn heat to low. Continue cooking until wings are cooked through, about another 5 minutes. Remove from grill onto a platter for serving. Good catch, I must have accidentally deleted the chicken wings when I made a few final changes on the recipe. I just added them back in. The amount is 3 pounds-It doesn’t have to be exact. I just made them with chicken tenders tonight and I think I may like it even better with the chicken tenders. Oh wow, I just love this flavor! I can’t wait to try this chicken recipe! These sound absolutely incredible!! That is some major flavor in that bbq sauce. And your photos are gorgeous! The strawberry BBQ really stands out!! I know these wings have to be amazing! I love love love creating my own wing sauces! I can tell you put a lot of love into getting this recipe perfect! It sounds incredible! Thanks for the inspiration!